In 2018, Judith Shatin, William R. Kenan, Jr. Professor Emerita, retired after 39 years with the University’s McIntire Department of Music, including two terms as department chair. 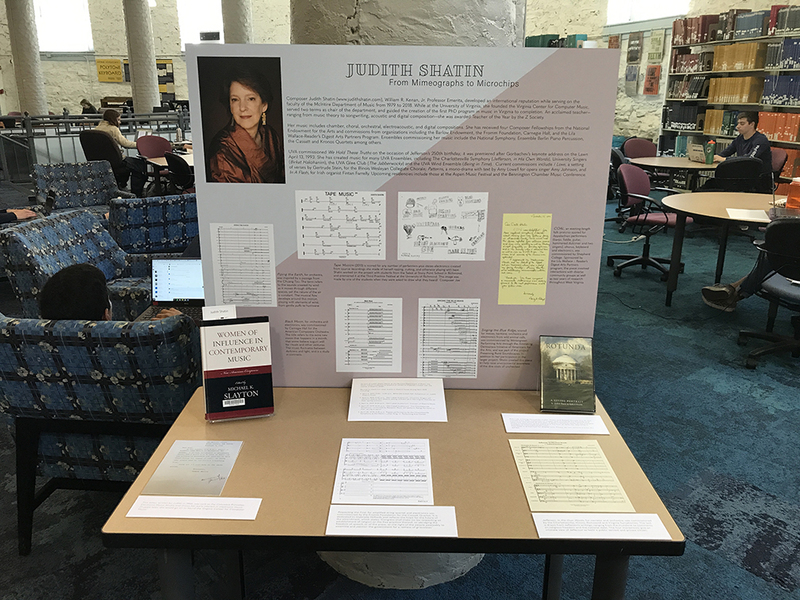 In April of 2019 the Music Library is honoring Shatin’s contribution to the arts at UVA, and her role as primary architect of the commonwealth’s first PhD program in music and first PhD in Composition and Computing Technologies, with an exhibition “Judith Shatin: From Mimeographs to Microchips.” The exhibition of selected scores, correspondence, and related material is part of a department-wide month of concerts, seminars, and other events celebrating Shatin’s tenure at UVA. For other events in the Music Department’s celebration, please visit the Shatin Music Month webpage. Shatin came to UVA from Princeton in 1979, dedicated to exploring the musical possibilities of combining sounds of the digital age with acoustic instrumentation. According to department chair Ted Coffee, she composed “exquisite” music that bridged a potential divide between the digital and traditional worlds. Under Shatin’s leadership, UVA in 1987 joined other elite institutions in establishing the Virginia Center for Computer music. In 2006 the Z-Society presented her with their Outstanding Teacher of the Year Award. Among items on display are examples of sheet music from Shatin’s compositions on the environment (Singing the Blue Ridge, Piping the Earth), and UVA history (Jefferson in His Own Words) that addresses Jefferson’s contradictory beliefs about freedom and slavery and his founding of the University, and a DVD of Robert Arnold’s film Rotunda, which she scored, combining more than 300,000 images and her music drawn from a full year of observing the Lawn. This entry was posted in Exhibit, News and tagged awareness, history, Judith Shatin, McIntire Department of Music, Music Library, technology by Mitch Farish. Bookmark the permalink.